The new version of StruMM3D is 8.4.0.31 (updated on 04/23/2019). Remember to visit the StruMM3D FAQ for hints, user/program tips and additional help. The FAQ was updated recently and has new info. The molecular model from the x-ray crystallographic coordinate data of CCDC 1220580. Notice how StruMM3D, using only coordinates and atom types, shows subtlties in bond types and delocalization. StruMM3D's molecular models can create molecular graphics for use in your daily tasks, presentations, reports and publications. StruMM3D can also be launched from the Graphical Thumbnails of it models (bmp, jpg, gif), a first among molecular modelers. The use of the StruMM3D (© Vernon. G. S. Box, Ph.D.) downloadable version, from version 8.0.0.1, is now unrestricted, but the program is still subject to our copyright, and our right to restrict or deny access to all, including registered users. Increasingly we have seen the Microsoft security protocols preventing the Str3Di programs from running as they should. This is a permissions problem that affects even some of Microsoft's non-system software. We advise all users of StruMM3D to use Windows File Explorer to open the \Str3Di folder, to right click on the StruMM3D.Exe file, select properties, then select Compatibilty, and then to check the box that says "Run this program as an administrator". Repeat this sequence for all of the Str3Di Exe files whose names start with "str". When StruMM3D is first executed it will run in its "novice" mode (the moreinfo environmental flag will be M). StruMM3D is packed with neat features, and so it is highly recommended that a new user tolerate the additional information hints (a few extra click of the mouse) until one's familiarity with StruMM3D has grown. When desired, these information prompts can be dispensed with (main menu-utlities-program parameters click on M). Remember that StruMM3D will create shortcuts to StruMM3D.Exe and StruMM3DX.Bat on your desktop from the Main Menu, HELP option. Use the StruMM3DX shortcut routinely since it minimizes the intrusion of the Microsoft UAC annoyance. StruMM3D now plays smaller MP3 audio files instead of WAV. StruMM3D can, automatically, determine the best covalent/ionic radius for metals in their complexes. These algorithms have been polished in every version since 8.3.0.12. Since no other molecular modeling program has this feature, we want to get it right. The covalent radii database for metals was also updated in the version 8.3.0.12. The QVBMM Force Field, and the structure drawing routines, were tweaked in version 8.4.0.30. Copy any CIF file into the \Str3Di folder to change the start-up molecular display. The first CIF found is the first CIF used (no libraries, please). StruMM3D is tweaked and updated regularly. Current users of StruMM3D will notice that the update file, StruMM3DUpd.Exe, is now, from Version 8.0.0.35, automatically downloaded into \Str3Di folder, whenever necessary. If you are using an old version of StruMM3D and the download does not occur, then manually download this program update, and follow the updating instructions given below. Some users will prefer to update their StruMM3D manually. They will navigate to the \Str3Di folder and left-click/run the StruMM3DUpd.Exe file, make sure to unzip the contents into the folder \Str3Di, then close. The rest of us, who wish to use the convenience of the auto-updater, will use the batch file StruMM3DX.Bat to load and run StruMM3D in the future. After the modeling session a window will appear to handle the updating process, just select unzip, to unzip the contents into the home folder, \Str3Di, then close. We continue to extend special thanks to the dedicated users of StruMM3D who have helped us find programme issues and suggest improvements Bugs are getting harder to find, and sometimes we introduce the critters unintentionally, but if you do find a bug, or have a suggestion, then contact us, please. The downloadable version is the complete and fully capable version of the powerful StruMM3D molecular modeler, but the software is copyrighted, all rights are reserved. StruMM3D can handle up to 10000 atoms and lone pairs (5000 per structure), and faster computers are better. All queries and assistance must be obtained from Exorga, Inc. Contact us anytime. StruMM3D_Setup_Files.Exe is a complete installation of StruMM3D that you can install as is described below. It creates a new folder, \Str3Di, that has all the bits and pieces necessary for an immediate use of the program, again, as is described below. This new installation mode now includes features that allow users, plagued by the Microsoft UAC bug, to run StruMM3D unimpeded, even with the UAC feature enabled at its most restrictive level. Str3Di32 is no longer supported. We strongly recommend that you replace your installation with a new StruMM3D package. We must recommend that you do NOT try to install StruMM3D into the "Program Files (x86)" folder, found on drive C: of Windows 7 through 10. Instead, try to install StruMM3D into drive C:\, or any other drive than drive C:, or create a new folder in drive C:, like C:\MyPrograms or C:\Chemistry, and install StruMM3D there. Windows is increasingly denying write access to the "C:\Program Files" folders, and this is preventing many third-party programs from functioning properly. Download the StruMM3D_Setup_Files.Exe file onto your desktop, or into some folder you can find easily, like C:\Temp. In Windows 7/8/8.1/10, very few non-system executables work well if not initiated by using the “Run as Administrator” option, so, now, right click on StruMM3D_Setup_Files.Exe, select “Run as Administrator”. When it asks where to put the files, instruct it to place the files into your selected drive, like C:\Temp, where you can find them easily. The folder you selected to contain the setup files will contain a batch file named INSTALL.BAT. If you find Install.Bat and simply left_click on it, it will reveal it's usage mode, and that will enable you to select where to install the program. Right_click on the Windows START button, open an admin command prompt window, and navigate to the folder with the setup files. At the command prompt, if you enter Install X: (note the space), this will install the StruMM3D program into X:\Str3Di. If you enter Install X: \AnyFolder (again, note the spaces) this will install the StruMM3D program into X:\AnyFolder\Str3Di. Just follow the prompts. Use Windows Explorer to open the folder c:\programdata. You should see a sub-folder \str3di and in that folder a file str3didrive.dat. Use NotePad to open that file. The third line of that file should have the name of the folder into which you installed StruMM3D. So if you had used the command line, above, Install X: \MyChemistry, to install the StruMM3D program, then this should say X:\MyChemistry (Note that there is no space in this address). If it just says X:, or C:, then change it. The newly created installation sub-folder X:\MyChemistry\Str3Di, or whatever, will contain all the files you need. One new bonus is the presence of the new file StruMM3DX.Bat in the \Str3Di folder. When you run StruMM3D and use the main menu's HELP sub menu to create the shortcuts you'll need on the desktop, one of these shortcuts will be for StruMM3DX, the other for StruMM3D. If you execute StruMM3D by clicking on the StruMM3DX shortcut then it will be unimpeded by the UAC screwup. You can also associate the StruMM3D files with StruMM3DX by executing, from a command window/prompt, the file assocstrx.bat. Look in the \Str3Di folder for the file StruMM3DUpd.Exe. If it is absent, then you should download the StruMM3DUpd.Exe package only (updated 04/23/2019). This self-unzipping archive zip contains a generic copy of str3didrive.dat, new support program, and database, updates, and new additions to the StruMM3D working environment, including help with the command line options. Copy the StruMM3DUpd.Exe into the \Str3Di directory, and then left-click on it, to unzip, the file. The destination/working directory MUST be \Str3Di. Before you run the updated program, ensure that you delete the file StruMM3DX.bat from the \Str3di folder. It will be replaced after the update is launched. If you have any issues during the next execution of StruMM3D, then delete the old program environment data file, STR3DISPLAY, whatever the file extension, and the current file StruMM3DX.bat, both from the \Str3di folder..
Click here to download StruMM3DUpd.Exe now (revison date 04/23/2019, the download size is about 1098 Kbytes). The StruMM3D.EXE program is about 1028 Kbytes. Click here to download the Installation file – StruMM3D_Setup_Files.Exe (the download size is about 2734 Kbytes, and it includes all the files and DLLs needed to run StruMM3D, utilities, templates, WAV files, and others). These self-extracting zipped files contain all the supporting programs for the StruMM3D program. All of the needed DLLs (that are normally supplied by the Windows OS but might be missing from your computer), the help file (program manual), many template molecular structure files, and other non-essential (but convenient) support files, are also included. REMEMBER, if you have any installed version of STR3DI32 on your computer, this version is no longer supported and will not be compatible with the new features implemented in StruMM3D. Please ensure that you erase ALL of the old files in \Str3Di, but keep all the data files in their current folders, before installing StruMM3D and any new version of this software. If your installation is not on drive C:, then remember to ensure that the C:\ProgramData\Str3Di\Str3diDrive.Dat file is properly configured before the first execution of StruMM3D. By now, most users of StruMM3D will know that the program will play various sound files, depending on the context. These sound files (in the MP3 format) can be downloaded here. You can also make your own sound files to replace the default sound that come with StruMM3D, but they have to be in the MP3 format, and you have to name them like those in \Str3Di\Waves in order to get StruMM3D to recognize them. If you have a favourite work background music/sound, then name this music/sound "mood_whatever.mp3" (where whatever is the name you use to identify the audio file) and put it into the Wave folder. StruMM3D uses the small, but extremely capable, open source, music player CoolPlayer.Exe, to play the sounds/music. Users of Windows Vista/7/8/8.1/10, will already have the required DLLs in their C:\Windows\System32 folder. Most computers will already have these DLLs in C:\WINDOWS\SYSTEM, C:\WINDOWS\SYSTEM32, or C:\WINNT\SYSTEM32. However, if you have the Windows Vista OS, or when you try to run StruMM3D you get an error message about a missing DLL, then download this VBRUN60SP6.EXE, copy it to your SYSTEM32 folder (see above) and unzip the file there. If you are only missing VB6 run-time files, these are available in the run-time library for VB6, vbrun60sp6.exe. Just download it and run/open it. Click VBRUN60SP6.EXE to download the run-time files for VB6 (about 1005 K). Once you have the file, just click on it and the VB6 run-time files will be installed into your computer. Users of Windows 7 or 8 should right click on the executable (EXE) file, select properties, select compatibility, and then select “Run this program as an Administrator”. StruMM3D needs a file named STRLOGO.LXS, for its proper functioning. If there is a crash during the first execution of StruMMD it could be because the critically important file STRLOGO.LXS was not found in the folder \Str3Di. There is a copy of this file in the folder \Str3Di\Data and so you can use Windows Explorer to copy the file into the \Str3Di folder. Also put a copy into \str3Di\Backup while you're at it. StruMM3D also needs a file named Str3DiDrive.Dat, for its proper functioning. This file is included in all installation packages, and should have been installed into Drive C:\ProgramData\Str3Di after your first use of StruMM3D. If your installation tells you that it is missing, look for a duplicate in the installation folder, X:\Str3Di where the program is installed. If this file is missing from X:\Str3Di then you can get a copy from StruMM3DUpd.Exe, above and place it in X:\Str3Di. Follow the instructions described above (New Users). You are encouraged to place a shortcut to StruMM3D on your desktop. While executing, StruMM3D, click on HELP in the main menu, and then there is an option to place a shortcut onto your desktop. Do that. Otherwise, open Windows Explorer, navigate to the \Str3Di directory, right-click on the file StruMM3D, and select the option to create the shortcut, then drag the shortcut to the desktop. When using StruMM3D you can save a graphic of the current image to the clipboard (there are three ways to do this within the program), and this simultaneously places that image, as a BMP file, into the current working directory and into the directory \Str3Di\Graphics. You can use this graphic in your publications/documents etc.. If you view the folder using Windows Explorer, you can see these thumbnails (Windows makes them from the BMP file, or any other graphics file in the folder, JPG, GIF) and these thumbnails show the molecules in glorious color. So, if you so you wished, you could have a visual/graphic display, in Windows Explorer, of all the molecules processed by StruMM3D! We then decided to make the creation of these BMP files automatic, again, if you wished, and so, every time a structure is loaded StruMM3D will quietly create the BMP file, capturing the view that you last had of the molecule. All you need to do is to enter the command "jpgbmp 1" into the I/O Box when StruMM3D is idle, once. The process can be discontinued by entering "jpgbmp 0" into the I/O Box when StruMM3D is idle, and remember to omit the quotations. As of Version 8.2.0.10, if you right click on a thumbnail, select "open with" from the menu, and direct the PC to use StruMM3D, then the molecular modeling of the selected structure will begin. After the first run the process is easier. In older versions of StruMM3D, the graphics file must be in the same folder as the stucture data file. 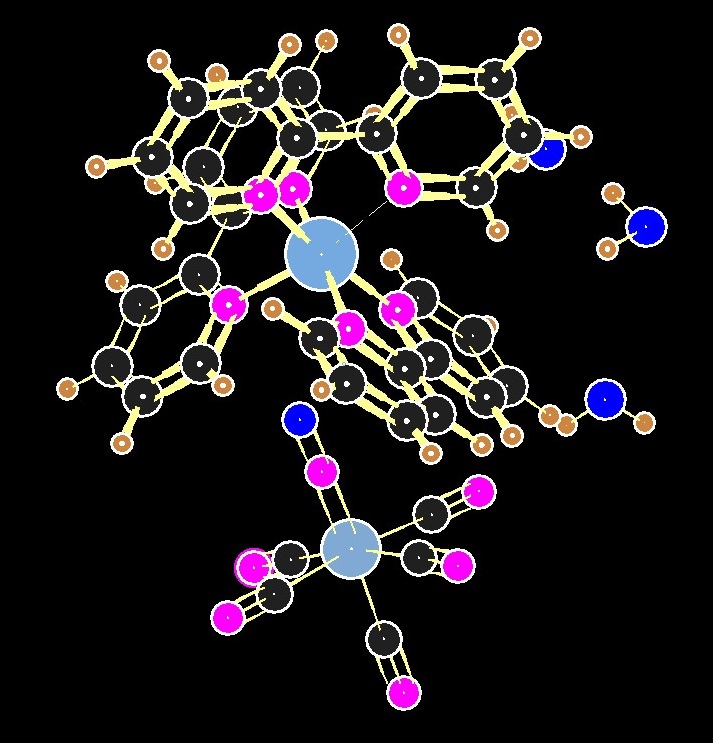 StruMM3D, from version 8.2.0.10, has now become the first totally graphical molecular modeling tool, and one needs not try to remember which structure data file name corresponds to which structure. You can see them. Remember that StruMM3D only backs up all the graphics files into the directory \Str3Di\Graphics, as well as into the directory with the structure data files. No So, if you have been using data from the directory \Str3Di\Data, the thumbnails will also be saved there (automatically), as BMP files, and that is where to use Windows Explorer to view and select the thumbnail you want to use to start a molecular modeling exercise. StruMM3D will use any graphics file in the formats BMP, JPG, or GIF, but it only creates BMP files. Having a lot of high resolution BMP files on your drive takes up a lot of space, but you can convert them to smaller JPG or GIF files since StruMM3D will also use these files. We recommend using the program "Magick" in the ImageMagick Software package to convert your BMP files to JPG files. If you want StruMM3D to facilitate this conversion for you, using ImageMagick's Magick or Convert, write to us and we'll show you how. If you have any trouble, with the installation, or the software, just send us an e-mail, to customer support, so that we can assist you.